The campy, cool Batman-esque theme song used over the intro credits really gets the party started in this costumed superhero romp starring an above average Paolo Gozlino in the title role. Opting instead to keep the pace up and antics high, the screenplay by Ernesto Gastaldi isn’t really the smartest, though in this genre it doesn’t have to be. Key to the plot and entertainment is an invisibility serum that both the hero and villains alike get ahold of with the resulting visual effects being hit and miss at times; however, it’s most amusing to watch the actors attempt to engage or fight with an invisible person. 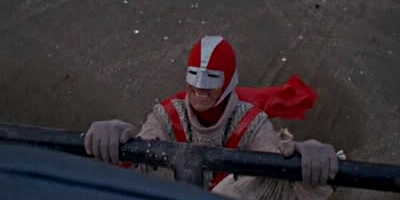 It’s hard to say who ran atop a moving train to save the day better, Argoman or Flashman, and though neither superhero can fly, Flashman makes up for this with some entertaining parasailing scenes. Easily recommended for Eurospy fans, this is great fun with topnotch babes and a kickass hero.